Inspired by the young Dutch soprano Aaltje Noordewier-Reddingius, Diepenbrock composed Gehoben ist der Stein (Uplifted is the Stone) for her in the first half of 1899. It is one of the Hymnen an die Nacht (Hymns to the Night) by the German early Romantic poet Novalis, a pseudonym for Friedrich von Hardenberg (1772-1801). Unlike the earlier song for soprano and piano Hinüber wall’ ich (I Pilgrimage Over There, RC 37) on a poem from the same collection, Diepenbrock directly conceived the new work with orchestral accompaniment. He started the work on 20 January and completed a piano score version on 4 March. He finished the instrumentation two months later, on 4 May. Diepenbrock’s letters from that time do not say anything about the creative process. Novalis’ Hymnen an die Nacht were written when the poet was overwhelmed by the unexpected death of his young lover. In seven rhyming stanzas of eight lines each, Gehoben ist der Stein describes the purifying influence the infinite starry sky can have, thus elevating it to a Christian-pantheistic symbol of the abolition of the division between mortal existence and immortality. Novalis opens with a poetic description of the dogma that through the resurrection of Christ, who at the Last Supper offered his body and blood, mankind partakes in eternal life, symbolised by a wedding that is brightly lit by oil lamps with fuel that never runs out. Death summons us to that feast; the twinkling stars in the distance beckon. In the third and fourth strophes Novalis addresses Mary, describing how those who once turned to her on the verge of death, now watch over us as children of heaven. The poet feels wrapped in their protective embrace when he says: “Wir kommen nun zu ihnen, / Um ewig da zu sein.” (Now we come to you, / To remain there forever.) So, according to the fifth and sixth strophes, the believer feels no grief at the grave, comforted in the knowledge that his beloved has passed into eternal life. Intoxicated by the golden wine in which the firmament dissolves, we ourselves will become lighting stars. The mystic rapture reaches a climax in the final strophe that mentions the passing into the full, timeless life that swirls as an endless sea. Just one night of this overwhelming bliss, an eternal poem, makes us realise that the countenance of God is the sun of us all. As a sounding symbol of the idea of the transition from death to life, Diepenbrock built the composition on one motive consisting of five notes that descend step by step, which – according to his annotation at the beginning of piano score A-41(9) – he derived from the final measures of the “Et sepultus est” from the Credo of Beethoven’s Missa solemnis. And do not feel any constraints. The voice starts with an ascending fifth and rises another minor second – a movement that continues in the second line. The upward movement continues in the following lines. After the repetition of seven measures from the introduction, comes the second half of the first verse. With human tongues and tone! is built on a motive from the orchestral introduction that deviates from the diatonic semitone steps, using an accentuated rhythm to enforce an unexpected forte character. Diepenbrock moves from 4/4 time to 6/4 time, giving the music (Zart und fliessend) a rocking character. Against chromatic lines in the low register of the orchestra, the high instruments play melodic garlands, accompanying the voice like musical incense up to the words “Um ewig da zu sein” (To remain there for ever). There the movement stops, to be replaced by the aureole of a beautiful chord progression that accompanies the phrase. Then a ‘sublimated’ reprise of the opening measures of the composition leads up to the fifth strophe: “Nun weint an keinem Grabe / Vor Schmerz, wer liebend glaubt.” (Now at no grave weeps / for sorrow any who love and pray.) A free translation of the music of the first verse follows, still in 6/4 time. On the final syllable of the fifth strophe the music returns to 4/4 time. An interlude with long melodic lines introduces the sixth strophe, which without interruption leads to the beginning of the seventh and last verse. Meanwhile, the music becomes more and more ecstatic and after the words “Es wogt das volle Leben / Wie ein unendlich Meer” (The whole life surges / as an endless sea) this is expressed – according to the score “mit grösster Begeisterung” – by the orchestra for eight measures. The descending second motive from the beginning of the composition returns on the final lines “Und unser aller Sonne / Ist Gottes Angesicht” (And the sun we all share / Is the countenance of God). The orchestral postlude harks back to the introduction as well, now also with reminiscences to the earlier variations of this motive. 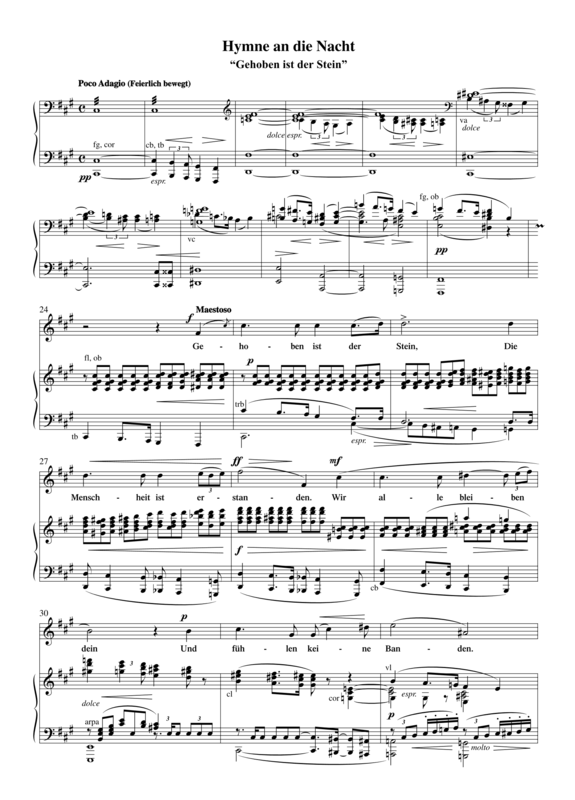 Structurally the composition can be subdivided into an exposition (verses 1-2), a contrasting middle movement (verses 3-4) and a free reprise (verses 5-7). Metrically the first part of the reprise (verse 5) is linked to the preceding middle movement. Thus Diepenbrock manages to express the contrast in Novalis’ text between the reality of being dead and buried (“et sepultus est”) and the prospect of eternal redemption, concentrated in the words “Gehoben ist der Stein”, in the musical structure and he prevents the middle movement from being an isolated part within the composition as a whole. The premiere of the Hymne an die Nacht “Gehoben ist der Stein” took place in the Centre of Arts and Sciences in The Hague on 27 June 1900 at the end of the third festive concert of the Nederlandsche Toonkunstenaars-Vereeniging (Dutch Musician’s Union). The concert with Aaltje Noordewier and the Concertgebouw Orchestra was also Diepenbrock’s debut as a conductor. The reviews were positive about both the novelty and the performance by the singer and orchestra conducted by the composer. Thanks to the affinity Aaltje Noordewier-Reddingius showed for the piece, Diepenbrock’s Auferstehungshymne soon became famous and was frequently performed. For example, it was played on 6 September 1912 at an invitation concert of a congress of life insurers (VIIe Congrès International d’Actuaires) and again in the Concertgebouw in October. In preparation for a printed edition of his main works that Diepenbrock was planning, for which on the occasion of his fiftieth birthday he had received a fair amount of money from friends, he made a new orchestration for Gehoben ist der Stein in December 1914. On 10 February 1915 he completed the score. He also made a new piano score for publication, like he had done for the hymn for alto that had already gone into production. In order to make it easy to play, not every orchestral part was to be included: no more in the old way (Wagner, Zweers), […] less dense, more nuance, at the same time more accompaniment and orchestrally more independent . 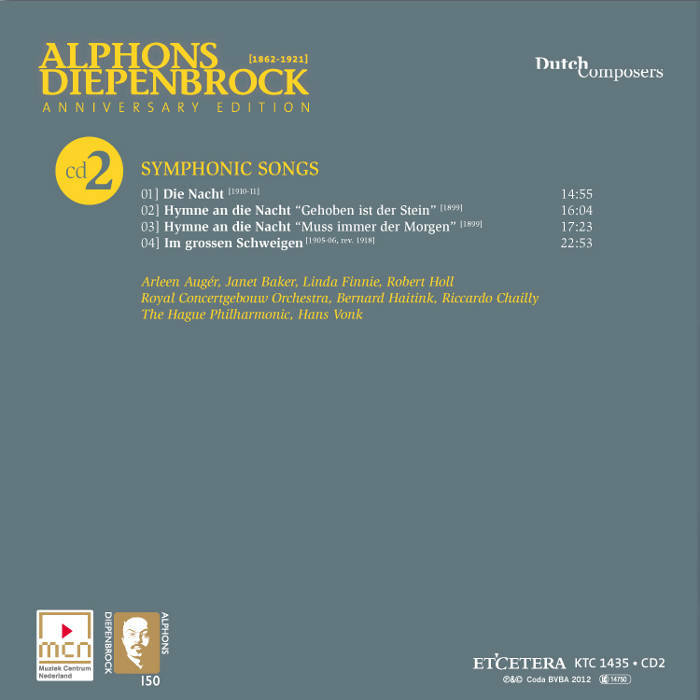 (BD VIII:473) Diepenbrock was so negative about the original orchestration that he destroyed the orchestral parts. Therefore it was impossible to organise a performance by the German soprano Gertrud Foerstel at short notice, as a letter to Mengelberg shows. (BD VIII: 437) Eventually, the edition of the Auferstehungshymne was only published posthumously. Um Öl ist keine Noth. Um ewig da zu sein. Wird nun sein Herz bewacht. 6 dec 1900: Eerste uitvoering in het Concertgebouw te Amsterdam van de beide Hymnen an die Nacht, gezongen door Pauline de Haan-Manifarges en Aaltje Noordewier-Reddingius en gedirigeerd door Diepenbrock (ter vervanging van Willem Mengelberg, die door ziekte plotseling verhinderd is). Het programma bevat voorts de symfonie in Es (KV 543) van Mozart en de Scène d'amour uit Roméo et Juliette van Berlioz, een en ander gedirigeerd door Bram Eldering. De kunst van Diepenbrock heeft zich in al haar hoogheid en diepzinnigheid geopenbaard op het abonnementsconcert van 6 December. Twee gedichten van Novalis, één in ongebonden en het ander in gebonden stijl, hebben Diepenbrock geïnspireerd tot het schrijven van toondichten, waarbij de zangstem de intentiën van den componist verklaart en weergeeft. Het is volkomen begrijpelijk dat Diepenbrock zich aangetrokken gevoelt tot den dichter Novalis. In beider gedachtengang vindt men een gemeenschappelijken, een analogen trek. Waar nu de woorddichter zulk een machtigen invloed heeft uitgeoefend op den scheppingsdrang van den toon-dichter, ware het wel wenschelijk geweest, dat het programmaboek den toehoorder eenigszins nader had gebracht tot den persoon van Novalis. [...] Zooals het bij een modern denkend kunstenaar niet anders mogelijk is heeft Diepenbrock het zwaartepunt zijner compositiën gelegd in het orchest. — Het orchest is de drager van 's componisten ideeën en met groot meesterschap heeft Diepenbrock zijn stof behandeld. De gansche opbouw, de indeeling en de behandeling der motieven, vloeien logisch uit 's dichters en 's componisten gedachtengang voort. Betooverend is vaak de klank van het orchest en bij beide werken kwam men onder een machtigen en verheven indruk. — Men begreep dat men bij Diepenbrock te doen had met een man, die wars van alledaagschheid, het verhevenste en het verheffendste in zijn kunst neerlegt. Misschien zal Diepenbrock later zelf nog erkennen dat hij vooral in de “Hymne an die Nacht” der zangstem een taak toebedeeld heeft, die zij tegenover de machtige golven van het orchest ter nauwernood kan vervullen. Misschien zal Diepenbrock later nog inzien dat de technische uitvoering zijner gedachten niet geheel gelijken tred houdt met het grootsche zijner conceptie. Zooveel is echter zeker, dat hij thans reeds bewondering en eerbied afdwingt voor zijn machtig talent.